I’m excited to be giving some Man Biceper an Under Armour sweatshirt! Yay you could have this sweatshirt! I don’t want to make you jump through too many hoops BUT I do what to hear some interesting comments! So what do you have to do to get one? Comment that you shared the post. In that comment on this post also state either the funniest aka stupidest thing you’ve ever heard about diet and exercise OR your favorite exercise move and why. You have until the end of the day Monday to enter! And on Tuesday I’ll announce a randomly picked winner from the comments! Ok so a few weeks ago, I was contacted by an Under Armour rep. about doing a product review and giveaway. I won’t do promotional things UNLESS I really believe in the company or brand – and I LOVE Under Armour. I actually gained a huge respect for the brand when they started the “What’s Beautiful” competition. So when he offered me a chance to review a product and give one away to a dedicated Man Bicep reader, I jumped right on the opportunity. I work in a gym with tires, atlas stones, barbells, dumbbells, ropes and sleds. While we do have a cleaning crew that does a great job, the gym does have that sort of dirty outdoor feel. BUT I do love wearing big comfortable t-shirts to workout in AND my Under Armour clothes. So anyway, I love my Under Armour stuff because it is cute but makes me feel comfortable and just seems to fit with all of the different things in the gym. However, most of the Under Armour stuff I have is short-sleeved and while it isn’t COLD here, in a gym with no heat, you do sometimes need a sweatshirt. And an Under Armour sweatshirt is one thing I didn’t have so I chose to review that product! I got the purple Fleece Divide Hoody and I LOVE it! It is warm and cute and comfortable (and I’m a fan of color so I love the brightness). I like mine loose so I got a medium and it fits perfectly! It is fitted enough without being skin-tight. It makes me feel like I’m wearing something stylish, but at the same time it isn’t so cute or fragile feeling that I’m afraid to get it a little dirty. It is perfect to lift in and perfect to coach in. So who is interested in getting their own Fleece Divide Hoody!?! Check back later today for the GIVEAWAY! P.S. I’ve decided breathing squats are going to be awful by the end of next week. Right now the weight is light enough that 20 in a row down to a low box isn’t bad, but once I up the weight next week…UH OH! So yesterday was beautiful outside so Ryan and I went to the park for a little outdoor workout session. We compiled a few things into a video for one of the Under Armour What’s Beautiful challenges. The challenge was to come up with an excuse to not accomplish your goal and then show yourself defying it. My excuse was “noise” – doubts and negativity from other people and my own self doubts. But I overcome all the noise by putting on my headphones and focusing on my workout! P.S. 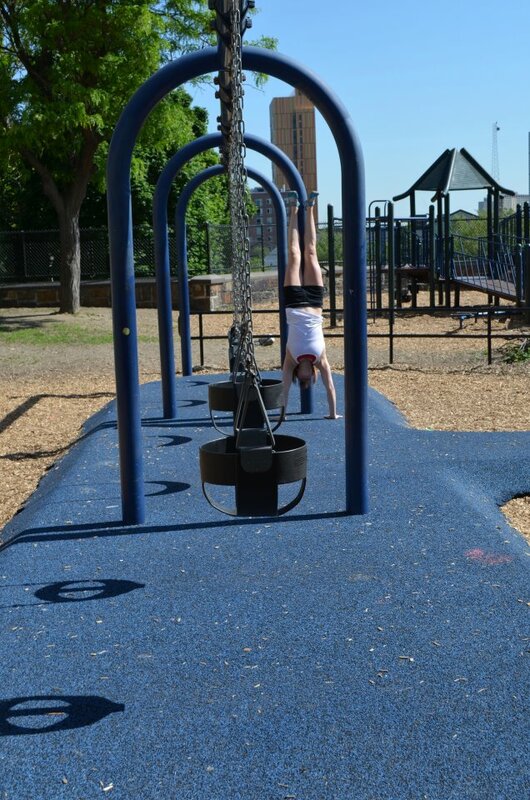 Can I just say I love to swing on the monkey bars!?! Ok I’m in a weird, but HAPPY!, mood today if you can’t tell from the title. Anyway, I told you a few days ago that I joined the Under Armour What’s Beautiful competition. And I also told you that I usually don’t like these challenges. One of the challenges in the competition is to get other people to join. I don’t endorse things I don’t believe in. While there are ads on my site, none of them are things I posted. While I love p90x, when Beachbody contacted me about promoting products (but I wouldn’t get to try them first), I turned down the offer. I don’t endorse things I can’t vouch for – things that I haven’t TRIED. But I like this competition. Under Armour has created a social network full of wonderful people who are all there to achieve their fitness goals. The competition provides a great support network AND provides ACCOUNTABILITY! It is a great opportunity for anyone looking for a little extra push to achieve their goals. I’ve always been a firm believer in leading by example. I won’t ask anyone to do something that I don’t or won’t do myself. And I constantly ask people to push their limits – to take on challenges that may be outside of their comfort zone. So here’s me stepping outside my comfort zone. I don’t like entering competitions like the Under Armour “What’s Beautiful” challenge. I don’t know why I don’t like doing things like this. I just don’t ever feel comfortable doing them. They make me super nervous. This sounds silly, right? I mean I’m the person that has freaking photos of herself up all over the blog and post about herself every day. But it’s true. These competitions aren’t comfortable for me to do. But I think Under Armour has created something great here, which is why I’m challenging myself to participate. This a chance to show what it means to be a true female athlete. Each participant must state a goal. And most of the goals people set have an end date – a clear conclusion. Compete in a triathlon. Run a 5k. Do an Ironman. But what if your goal is just to be able to do everything – to be a renaissance fitness woman? What if your goal has no end date? What if what you really want to prove is that a TRUE female athlete is a woman who has the drive and determination to take on any physical challenge that comes her way? I will be S.T.R.O.N.G.E.R. I will SUCCEED. I will be TENACIOUS. I will be a ROLE MODEL. I will OVERCOME OPPOSITION. I will NEVER LOSE HEART. I will GROW. I will be EMPOWERED. I will be a REAL WOMAN. I hope you all will support me on my journey to show just how STRONG all of us REAL female athletes are! P.S. 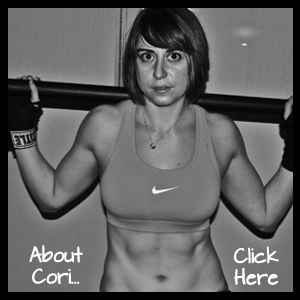 If you search for me, I’m listed as Cori L.